How do you store your preps? Are they neatly organized, where you can grab what you need at a moment’s notice? Are they a jumbled mess that makes your house look like an abandoned storage facility? Perhaps they are hidden chaos, tucked away neatly in drawers and closets, but with no rhyme or reason. I like to consider myself pretty organized. After all, my house is tidy (at least when people come over). I keep my food preps in one area, my medical preps in another area, and home supply preps in yet another area. It doesn’t matter how many preps you have if you can’t find what you need. A turning point for me was when my daughter burned her hand making cookies one time, it took me more than half an hour to find the specific ointment I wanted to use to treat it. I used raw honey from the kitchen for immediate relief while I turned my medical supply closet upside down looking for it. Fortunately, it wasn’t a bad burn, but what if it had been? What if it had been some kind of crisis that required immediate and swift intervention and the First Aid items needed had been mixed in with the bathroom supplies? Here’s something else. How many of you have sought in vain for an ingredient that you know you have 77 and 1/3 boxes of, only to have to go to the store to purchase it because you can’t find any of those elusive boxes? When you stock up the way a lot of us do, organization is vital. Otherwise, important supplies go missing. You spend valuable time searching for them and money replacing them, even though they’re lurking under your bed, taunting you from the shadows under there. Even worse, sometimes food expires while it’s tucked away, forgotten and unrotated into your kitchen, leaving you with pounds of edibles so stale that they can’t be consumed. 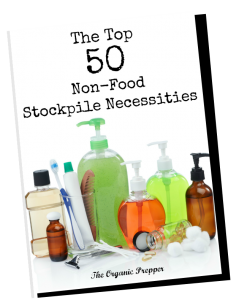 The biggest stockpile of supplies in the world won’t do you any good if you can’t find what you need when you need it. Now is the perfect time to get organized. Why wait? The longer you put it off, the worse the chaos will get. I live in an older house without a lot of closets or pantries, so I have to be creative to stash all my stuff. This hodge-podge of storage spaces can lead to the disappearance of supplies or “Where-did-I-put-that?” Syndrome. Resolve to no longer be a “Doomsday Hoarder”. Check out these 6 OCD hacks to help organize your supplies and bring order to the chaos. To reach a point of order, you have to, painfully, start with a huge mess. Expect this process to take 2-3 days, so don’t start at a time when you have lots of other stuff to do. Your first step is to take everything out of every little hidey-hole around your house. All of it. Every single bit. Only then can you see what you have. Put like items together. Once you have everything out, begin to group like items together. Maybe your grains are on the kitchen table, with the buckets on the floor nearby. Maybe your stash of vitamins is on the kitchen counter. Whatever your supplies are, consider the things that go together. Make an updated inventory list. Do you have as many supplies as you thought you did? Do you have more supplies than you thought you did? Write everything down in a notebook. Don’t worry about how you jot things down – you’ll organize your inventory master list later.
. (Mrs. Meyer’s is pricey but wonderful.) Scrub everything down and then leave it open to air out while you’re organizing your stuff. Once you have everything you own, grouped by category and covering every available surface in your kitchen, you’ll have a better idea of the types of containers that you need to keep things organized. I also really like for my containers to match, but maybe that’s just me. I feel like it looks more organized that way. Certainly, don’t go spend a lot of money on matching containers if you already have containers. that you can purchase for a fairly reasonable price. on a small shelf in my pantry to corral small items like little packets of seasonings, dry soup mixes, cupcake liners, and decorative items for baking. Use baskets for items that are needed frequently. If you have some items that you use often, corral them in baskets for a tidy, uncluttered look. You can pick up baskets inexpensively at any thrift store. Simply spray paint them all the same color for a uniform look.
. They’re extremely sturdy and designed to stack perfectly. Since they’re cardboard, you can easily write on the outside with a Sharpie. You can get them at a great price on Amazon, or from your local U-haul store. Be creative. If budget constraints mean that buying new containers for your stockpile is not in the cards, be creative. Use the things you have on hand. Give cardboard boxes new life with a little bit of pain on the front. Cut them down to the size that works best for your home. Paper grocery bags, while they can’t be used to lug heavy supplies around, can be rolled down and used to contain small supplies that would otherwise be floating loosely around your shelves. Every room in the house is fair game. There’s no reason that food must only be stored in the kitchen. Keep similar items together, for the sake of organization. Think about the grocery store – it’s generally easy to find items because similar things are organized together. There is a condiment aisle, as cereal aisle, etc. You can apply this principle to your home storage also. Beware of extremes in temperature, moisture, and rodents and other pests and store items in the past possible environment for their shelf longevity. In the event of a long term disaster, your neighborhood will be filled with hungry people. Even in a short term disaster, as we saw in the aftermath of Hurricane Sandy, some people are without food after only 2-3 days. You don’t want your home to be known as the one with all the food. During an event of civil unrest, you could become a target. Store your food and supplies in a way that they are not noticeable at a casual glance. The most important step comes before you actually put your supplies away. You have to create a master list to serve as a “treasure map” to your supplies. Three paces towards the setting sun, one baby step left, look up. That kind of thing. I can’t even tell you how much I love creating master lists like this. hung on the inside of the pantry door. Lots of people love spreadsheets, and keeping your map on the computer is a great idea….unless the grid goes down. It’s important to have a hard copy for that reason. If you make a spreadsheet, be sure to print it out. , divided into sections, with my map. Kitchen Pantry: Items currently in rotation live in the kitchen pantry. When these items get low, I rotated in their replacements from the other location. Kitchen shelves: Home canned foods – these will be eaten within a year of preserving them, so I keep them handy. Mud room: I installed shelves to make it easier to find things. This room gets cold in the winter and hot in the summer, so I don’t store food here. Laundry supplies, cleaning supplies, dish soap. Candles, lighters, extra solar lights, matches, lamp oil, batteries. Tools, screws, nails and other small hardware. Blanket Storage area in guest room sofa: Beans. Bags and bags and bags of beans that have been sealed into Mylar bags and placed in a bench that has a lid that lifts for storage. Armoire in guest room: “Decorative” boxes (I glued attractive paper to the outside or cardboard boxes I got for free at the grocery store) are full of baking items like baking soda, baking powder, chocolate chips, etc. Laundry room closet: 5 gallon water jugs and buckets of bulk grains, floor to ceiling. I wrote on the front of the buckets with a Sharpie for ease in finding the grain I’m looking for. Living room bookcases: There is a curtain running in front of the bottom shelf. Behind the curtain are dozens of jugs of white vinegar, as well as balsamic vinegar, apple cider vinegar, and red wine vinegar. Front hall closet: Rubbermaid containers with pasta, rice, and quinoa. Linen closet : Grocery store canned meats (we never use these and they exist as a last resort), fruit, dry milk, and pie filling. Medicines, vitamins, and first aid supplies. Bedroom closets: The back wall is lined with boxed goods like cereal, crackers, etc. There is a cool bungee cord grid holding the boxes in place. Clothes hang in front of this stash. Under beds: under-bed containers filled with dry pet food sealed in mylar bags. First Aid Kit: Sure, you will have lots of miscellaneous supplies too numerous to stash inside a kit. 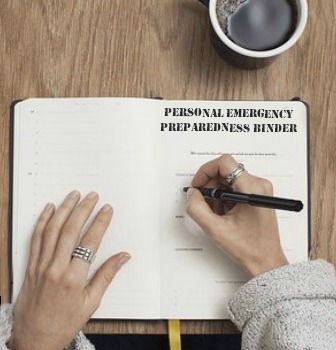 But keep the basics in one place so that you can immediately provide attention in an emergency. I use a fishing tackle box for this. Pandemic Response Kit: When it looked as though Ebola was going to race across the country, I put together a large tub with pandemic supplies such as Tyvex suits, N100 masks, bleach, bleach wipes, etc. Power Outage Kit: This kit is made easy to access so I can find everything in the dark. Right on top is a headlamp so I can go through and access the supplies we need. This kit has candles, lighters, matches, flashlights, batteries, etc. Bug-out Kit: Of course, the ultimate kit for preppers is your bug out bag. See this article for instructions on putting together a near-perfect kit. Water Kit: I have a container earmarked for a water emergency. In it, I can find spare parts for my Berkey, water purification tablets, testing kits, etc. Irreplaceable Items: During the King Fire, when we thought we were going to have to evacuate, I packed a box full of special items that are irreplaceable: baby pictures, a couple of special books, some heirloom jewelry, and other sentimental items. If you have to bug out, there are some things that you’ll want to take with you. If those items are already packed up, you won’t have to spend valuable time looking for them. Ahhhh….finally. You’ve gotten through all of the other steps and you get to put all those things away. (And maybe even be able to cook a meal since your kitchen will be clear again! Wipe things off as you go along. Keep a damp cloth handy while you’re putting things away – you don’t want to put away dusty, grimy supplies in your nice clean storage areas. Check your expiration dates. Put the items with the closest dates where they’ll be used before they become stale or spoiled. Be sure to record everything on your map. You can include details like expiration dates, quantities, etc., to make your map a running inventory. Keep a separate list of things you’ll need soon. Are you lower on bandages than you thought you were? Maybe you only have a couple of tubes of antibiotic cream left. Make a list that you can keep with you while you watch for sales throughout the year. There….isn’t that better? I know I always feel good when I can lay hands on my supplies immediately. Do you have any tips that help you keep your supplies organized? How often do you go through your stash and inventory it? Please share your advice in the comments below.